After about a year of use, I took the plunge and tried cleaning the sensor of my Canon EOS 350D. Maybe others will be interested in my experiences with this process, so here goes with a short account. The whole experience was a good deal easier than I had thought it might be. Since then, I have cleaned my other DSLR's (40D and 50D) using exactly the same technique, with success every time. There is plenty of material on the Internet about this subject, but a lot of it is contradictory and the 'best' information seems a bit scattered. A good tutorial is on the Copper Hill website, which describes the process of wet swabbing using PecPads wrapped around sensor swabs. I read this account carefully, and subsequently followed much of it, but I didn't fancy the idea of preparing the swabs themselves, nor was it clear where I could get all the components in the UK. I ended up ordering some pre-prepared sensor swabs (just use out of the packet, after applying a couple of drops of the Eclipse fluid), sized exactly for my camera (you specify your camera model when ordering on-line), together with some Eclipse fluid and a low cost Hurricane blower from Digipad. For 5 swabs, all this cost less than £20, and the order arrived in a few days - no problems at all, despite their website! The downside of the pre-prepared swabs is their price - some £2 each - but I reckon its probably worth it, especially for beginners - even several are a lot less than the cost of getting the camera sensor cleaned professionally. Probably the best method of minimising dust problems is never to change the lens, but with the x1.4 converter as an option, I do keep swapping it in and out, quite frequently, but each time I do try to be as quick as possible. Nevertheless, very early on, I got a biggish dust spot - but it was well away from the centre and even at max aperture (f5.6) it often didn't show up at all. When it did, it was often in the sky or other uniform background, and could easily be removed with Photoshop's clone tool. 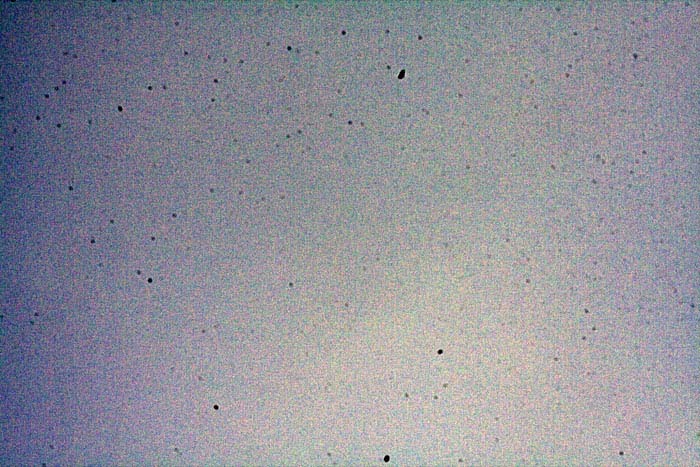 However, if you reduce the aperture to the minimum (f32) and point at the sky, all the dust spots are revealed in horrible detail. Here is what I saw a few weeks ago - using Auto Levels in Photoshop. Ugh! 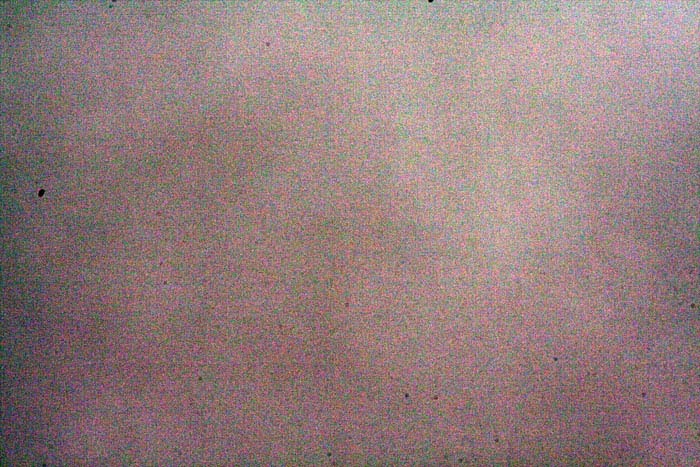 Note the brute of a spot top centre, (the one which sometimes becomes visible on "real" pics as mentioned above), but all the other spots have never shown up. I am sure all these spots, even out-of-focus, don't help the overall image quality - they must reduce contrast if nothing else. The horrible starting point - after a years use! Add two drops of Eclipse fluid to the swabs and let it disperse into the swab for a few seconds before applying to the CCD. Make sure you don't touch the swab with the fluid container - just squeeze a little and out it comes! When cleaning the CCD, I move the swab once from to left to right, and then back again (right to left) maintaining contact with the CCD the whole time. I never withdraw the swab from the camera and then go back with it to try cleaning again. I always use a fresh swab if it turns out I didn't remove all the dust spots first time around. After blowing with the Hurricane only - got rid of the large spots visible above and quite a few of the smaller ones. After second blowing and second wet swabbing - only a few spots left now, but what are these nasty looking diagonal streaks? As above but a few minutes later. The diagonal streaks have gone, but a brute has appeared centre left! 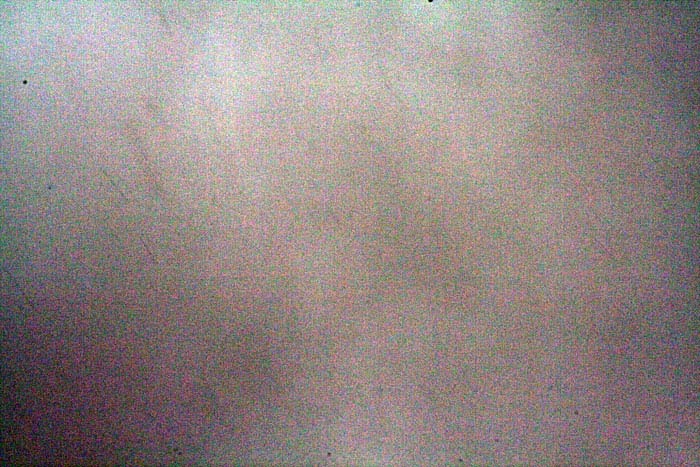 I guess this extra spot must be due to dust just floating around inside the camera, and it might go and/or another appear. Anyhow, having now used up 3 (1 for practice and 2 on the camera) of my 5 swabs, I decided to call it a day for the time being. Since I wrote the account above, I have cleaned the 350D sensor several times, and also the 40D and 50D sensors on my newer DSLRs. In all cases, the combination of first dry blowing with the Hurricane blower, followed by the wet swabbing, worked well. No real problems at all, and the funny streaks shown above have never re-appeared. 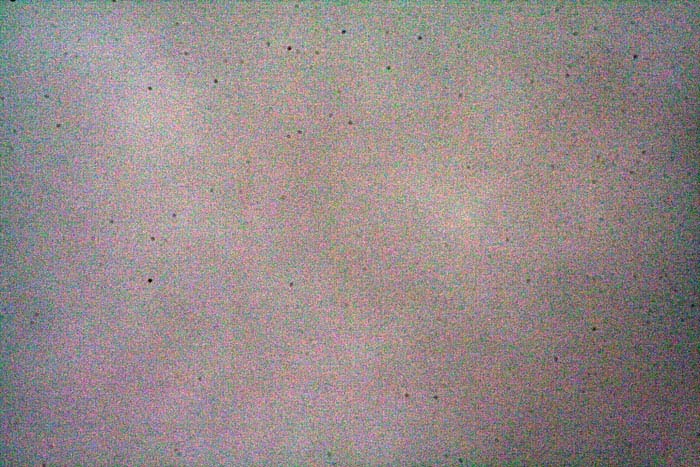 Sometimes I have needed to use 2 or even 3 swabs in a session to get the CCD into a state I was happy with (few if any significant dust spots left). Note that I find the so called sensor clean function available on the EOS 50D to be of limited value - it still accumulates dust spots just like the 350D and needs cleaning from time to time. 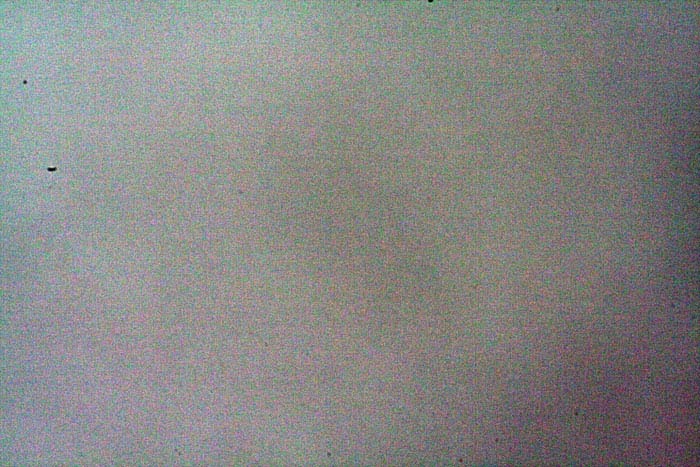 After using the swab on the sensor, I once tried wiping round the inside of the camera, in the immediate vicinity of the sensor. It may have helped to reduce the re-appearance of spots, but it is difficult to tell. I would suggest first trying the blowing technique on its own, using a Hurricane or similar. This can reduce the number of spots, and might be sufficient without going further. If you are not satisfied with the results of just blowing, then I can recommend the wet swabbing technique. It isn't too difficult to do, and the risk of permanently damaging the AA filter seems low. But completely removing all dust spots seems difficult/impossible. Swabbing the inside of the camera as well (with the same swab but after doing the sensor), to reduce the general dust levels in the camera, could be worthwhile. Having said all this, keeping the sensor completely dust free seems very difficult, and is probably not worth it either! Have you found this new page useful? Got any comments/further tips? Why not get in touch by e-mail?